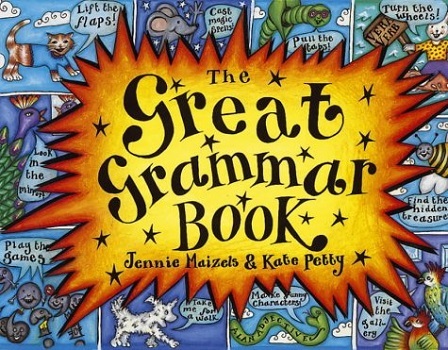 A brilliantly interactive book from award-winning illustrator Jennie Maizels that makes learning grammar fun! Turn the wheels, lift the flaps and pull the tabs to learn all about nouns, punctuation and sentences. Play heads bodies and legs to find out about adjectives, look in the mirror to discover what a pronoun is, and take a dog for a walk as he explains prepositions! The Great Grammar Book was released a few years back and has just been re-released. It is a wonderful, fun, colourful learning aid for any child trying to understand the world of grammar. From verbs to adverbs, nouns to conjunctions, and much, much more, the book covers them all in an easy to understand, eye catching, interesting manner. The author used unique techniques and animal characters to keep the children interested. Meet Nicola Noun, Vera Verb, Alan Adjective, Annie Adverb, Percy Pronoun, plus many more. Children will love spinning the wheel, pulling the many tabs, and enjoy the pop up scenes. The book was illustrated by award winning illustrator Jennie Maizels. Her illustrations in the book are bold, beautiful and very eye catching. When in comes to learning some children thrive in the classroom, others need a more hands on approach, and easy to understand methods, this book does just that. This would be just as useful at home as it would be in the classroom. A lovely educational book that will help kids and most likely some adults with their grammar skills. Kate Petty lived in Cornwall with her husband, Mike, before tragically dying from cancer in May 2007. She was both an extraordinary writer and an extraordinary person. The author of a number of novelty and pop-up books, including the innovative The Great Grammar Book and The Wonderful World Book, Kate was also involved in creating amazing books for the Eden Project children’s book list.